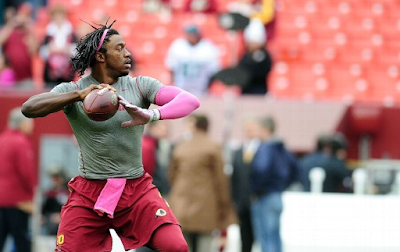 Can Robert Griffin III succeed in Cleveland? The saga of Robert Griffin III has finally moved on to a new chapter because as of early this afternoon, Griffin is now a member of the Cleveland Browns. It comes nearly four years after the Browns came close to trading up to be able to take Griffin but instead got beaten to the punch by Washington. Could the Browns be the team which can help Griffin showcase the talent that made him the Offensive Rookie of the Year in 2012? Or will he just become another Cleveland quarterback also-ran? It is important to note that Griffin is not going to automatically become the starter for the Browns as the team is still expected to use the second overall selection on a quarterback and new head coach Hue Jackson did tell him that he very well may have to compete with a top pick. To his credit, or perhaps feeling he had no other choice, Griffin reportedly was game. All in all, it is a solid gamble for the Browns here, a franchise that has failed to find a franchise quarterback since reentering the league in 1999. Griffin does not come at a particularly high cost at a two-year, $15 million contract and considering some of the crap that the team has fielded at the position over the past few years, he could be an upgrade. And besides, I do think that Griffin can make it as a starting quarterback in the NFL. Obviously things did not work out in Washington outside of his rookie season, I do wonder what would have happened had he not destroyed his knee in the playoffs against the Seahawks three years ago. Jay Gruden replacing Mike Shanahan didn't really help matters because Gruden may no effort to try to fit Griffin into his offense, ultimately leading to Kirk Cousins taking the reins this past season. Hue Jackson, as we all know, is a highly regarded offensive playcaller and has done quality work with many a quarterback and he just may be the coach to work to Griffin's strengths and put him in a position to succeed. But ultimately, the key to Griffin's success comes is Griffin himself. He has to develop more of his game, including showing comfort in the pocket and not looking to run when the first receiving option is covered. We know he has the tools to become a solid starter and, even considering the history, has found himself in a situation he can succeed in. But given the likelihood that the team takes a quarterback early, he's going to have to fight for a shot.